12.3MP Four-Thirds sensor, which appears to be based off the same sensor used in the E-620 and E-30. If that’s the case, I wouldn’t hold out for any revolutionary leaps forward (and Olympus isn’t advertising any either), though the E-30 sensor’s a solid performer given it has 1/4 the area to work with compared to Nikon’s and Canon’s best, and still thoroughly trounces anything coming out of Sony’s factory. A standard 3fps continuous shooting, as if you’ll be doing any serious sports shooting with it. Sensor-shift image stabilization. Panasonic left this out of their first G(H)1 Micro Four-Thirds cameras in lieu of lens-based stabilization. This was more or less a no-brainer for Olympus, which doesn’t have strong development in lens-based IS and lens IS would have completely defeated the purpose of Micro Four-Thirds with its added size, weight, and cost. SD format. How many out there breathing a sigh of relief (or perhaps shedding a tear?) that it isn’t xD exclusive? MF-2 adapter for Olympus OM mount lenses. An interesting option, particularly since the range of Micro Four-Thirds lenses is fairly slim at the moment. 1280×720, 30fps video (720p). As one would expect, video is definitely a feature of the E-P1. There’s nothing very extraordinary about it – the resolution is middle of the road, though you will get aperture-priority control and stereo sound. Unfortunately, maximum recording time is limited to 2GB files and/or 7 minutes at 720p resolution. Lack of a built-in flash. Though it’s not quite a dealbreaker given that its high-ISO capabilities will be far superior to that of a normal compact camera, the E-P1 does noticeably omit a built-in flash of any sort. 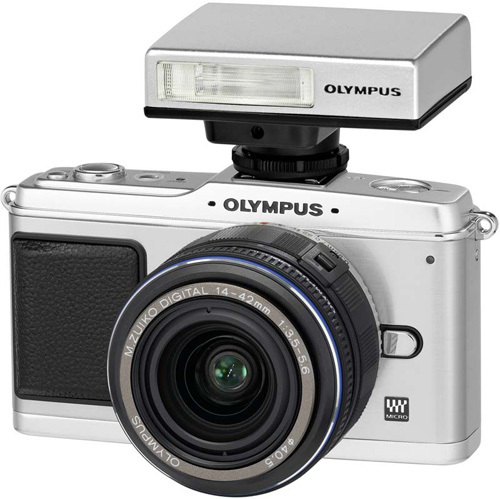 Olympus wants to sell you their FL-14 flash attachment that essentially does the same thing, and while it is custom-designed to match very well with the E-P1, having to carry another attachment for full-functionality somewhat defeats the purpose of a making a camera as compact as the E-P1. The E-P1 and ridiculous flash attachment they want you to buy for basic direct flash functionality. 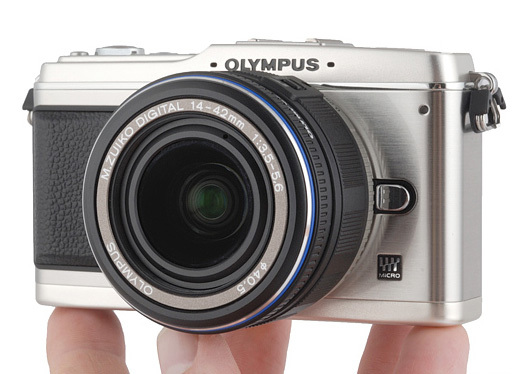 Oly seems to have gone all-out with the retro design, which does look different and not quite as Spartan or industrial as something like the Sigma DP1. With the E-P1 announcement comes a couple of new lenses designed for the E-P1 in mind: a compact 14-42mm kit lens and a 17mm pancake. The new M.Zuiko isn’t so much of a special lens – it’ll provide the equivalent of a pretty much standard 28-84mm equivalent view. What’s interesting about the Micro Four-Thirds kit lens is that it uses a drastic retractive design that makes it really compact – 43.5mm (1.7in) to be exact. This compared to the 61mm length of Olympus’ regular Four-Thirds 14-42mm and the 70mm length of a lens like Canon’s 18-55 kit. The 17mm f/2.8 pancake is probably the most interesting Micro Four-Thirds lens to come around yet. 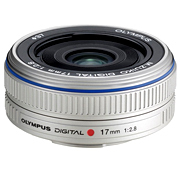 The lens is thin – a depth of just 22mm (0.87in), and results in a camera thickness of just 2.3in when attached. It’s also an f/2.8, which will help with low-light, though I wouldn’t hold out for amazingly shallow depth of field capabilities at this focal length on a 2x crop sensor. As a first and only Micro Four-Thirds pancake lens, though, I find the 17mm focal to be a bit conservative – it gives a 34mm equivalent in that no-man’s range: it’s not a 50mm equivalent portrait lens, and it isn’t as versatile as a 28mm wide-angle either. Hopefully Oly or Panasonic remedy this soon. Amazon has the E-P1 listed at $750 for the body only, $800 for the 14-42 kit, and $900 for the 17mm kit. Retro-styling aside, the name of the E-P1 game is size. It is undoubtedly the key point of interest for many consumers, who up to this point have not really had quite a solution like the E-P1 for a high image quality camera which has almost the portability of a compact camera. We’ll take compare the E-P1 in its two lens kits to several other high-quality compact cameras. Canon G10: Not a very compact camera, and it doesn’t produce very high-quality images either, but it’s included for reference’s sake since it seems to be the most popular camera in this class. Fujifilm F200EXR: The only true ultracompact in the bunch, the F200EXR and its SuperCCD EXR sensor is about as good as it gets, though it has a variety of tradeoffs and achieves high resolution, noise performance, and dynamic range in different modes. Panasonic LX3: The current king of premium compact cameras, due to both an excellent sensor and a superb lens. Sigma DP1: A now-aging but still unique large sensor, fixed lens camera using Foveon’s innovative X3 sensor. Sigma DP2: A variant on the DP1 which uses the same sensor but features a more mid-range lens. The following table displays the size of the various cameras, along with 35mm equivalent focal lengths and apertures (for purposes of depth of field). These equivalent specifications normalize high ISO performance (based on sensor size – this doesn’t take into account differing sensor technologies). We can see here how clearly inferior cameras like the Canon G10 and Fuji F200 are, though to Fuji’s credit, its superior sensor will give it much more of a leg up on the G10 than the simple sensor size implies, and to both their credit, they pack significantly more versatile zoom ranges than any of the other setups on this list. Panasonic’s LX3 is an interesting camera – while its sensor isn’t that much larger than other compacts such as the G10 or F200, it makes up for it with an impressive lens which packs an f/2-2.8 aperture in real terms. While the f/9.4-13 range isn’t going to turn any heads, it really isn’t so far off from the f/7-11 range of the E-P1 (or any other Four-Thirds camera) paired with the 14-42 lens, and carries with it the advantage of a much, much more compact size (half the thickness of the E-P1 setup). The Sigma DP1 and DP2 is where the competition gets a bit more interesting. Ignoring the intricacies of the Foveon sensor for the moment, we can see that when paired with the 17mm pancake, the E-P1’s 34mm f/5.6 equivalent is sandwiched right between the wider-angle, smaller aperture DP1 and the narrower-angle, larger aperture DP2. The 17mm pancake really is in a no-man’s land – not really wide enough for landscapes and not really narrow enough for portraits. Size-wise the E-P1 is nearly the same as the DP1/DP2, though a fair bit larger area-wise. Of course, the Foveon sensor throws a bit of a wrench into the image quality equation. Say what you will about the Foveon vs. Bayer debate, but in its present (or more precisely, now three-year old form), the 4.6MP DP1/DP2 sensor simply doesn’t stack up with the 12MP E-P1, from a resolution standpoint and definitely from a noise standpoint. On top of this, the E-P1 has a number of other advantages over the Sigmas, namely a video mode and the ability to switch lenses (though this somewhat throws the portability comparison out the window). Of course, there’s really nothing like the E-P1 and 14-42mm, which provides a camera with a full 28-84mm standard range, and weighs in at 3.1 inches thick. At this size, it’s far beyond the pocketability threshold, though it’s still far smaller than any of the regular DSLR kits out there. So what’s the verdict on the E-P1? Olympus and Panasonic have struck on a really innovative system here, but they’ve got a narrow window to capitalize on building the premier high-quality compact system, before Samsung’s NV system rolls around and before Canon/Nikon finally bite the bullet and buy into the mirror-less EVIL system. The 17mm pancake is a step in the right direction, and really plays to the strength of the Micro Four Thirds format – small bodies with small lenses that bring large sensor image quality just to the very edge of portability. There’s little to no point in trying to turn a camera like the E-P1 into a full-fledged SLR-like platform – even with the most compact kit lens they could make, the camera is far beyond pocket portability, and at this point if you’ll have to carry a camera bag around it may as well be something full-fledged like a Panasonic G1 or Olympus E-620. This entry was posted on Wednesday, June 17th, 2009 at 23:46	and is filed under Market Analysis, News. You can follow any responses to this entry through the RSS 2.0 feed. You can leave a response, or trackback from your own site.